Most houseplants will tolerate a few days' absence without suffering, but absences of more than a week call for some creative measures to provide valuable moisture in the right quantity. 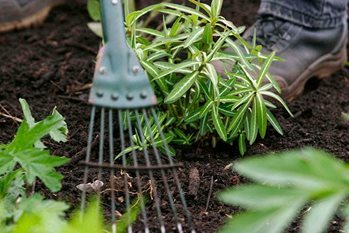 A little general maintenance, such as removing dead flower stalks, helps ensure plants are in good condition for when you return from holiday. Credit: RHS/Tim Sandall. In the case of short absences during the summer, giving plants a thorough watering before going away may be sufficient. Moving them to a cooler room or away from a bright window will help prevent them drying out. This method is useful for large single pot plants. Use a large container to hold water, and a piece of capillary matting as a wick. Insert one end of the wick into the reservoir and tuck the other end into the plant pot. This will enable the plant to draw on the water reserves in the reservoir. Use this method for collections of smaller pot plants. It may not work with pots that have broken crocks in the bottom. Place a sheet of capillary matting on the kitchen sink draining board or a suitable surface next to the bath. Drape one end of the matting into the sink or bath, which is filled with water. Plants should be grouped on the wet matting, ensuring they make good contact with it by pressing them down slightly. Clay pots need a thorough watering first for them to start drawing up water from the mat. Use this method for short-term absences only. Place a clear plastic bag over your plant and seal it closed. This allows water vapour to be collected and recycled by the plant. Keep the sides of the bag out of contact with the plant by supporting the bag with canes. These containers have built-in reservoir systems. They are best suited to plants that need moisture year-round and do not mind being grown permanently in moist conditions. Plants such as Citrus (which need less water in winter than in summer) are less suited to such permanent growing systems. Plants can be temporarily re-potted into reservoir pots if desired. In the winter houseplants can be left for a week or two with no attention, except to ensure that the temperature does not fall below the minimum they can tolerate. Move plants away from windows (where it can get cold) and water them before leaving so that the compost is moist but not waterlogged. Problems can occur with the system of watering, such as reservoirs drying up if they are small or wicks slipping out of pots if not well tucked in. Waterlogging may also occur where a plant’s water requirements have been overestimated. This could result in rots such as grey mould. On the other hand, if you underestimate water requirements, plants can develop powdery mildew as well as coming under attack from pests such as red spider mite when they are dry at the roots. If going away for longer than a couple of weeks, it may be preferable to arrange for a trusted neighbour, friend or relative to water the houseplants while you are away.